Tone 9 offers the Intention of Patience in an effort to see the bigger picture. The completion of cycles is all important to 9. There is something more to learn from looking at our understanding from a broader perspective. 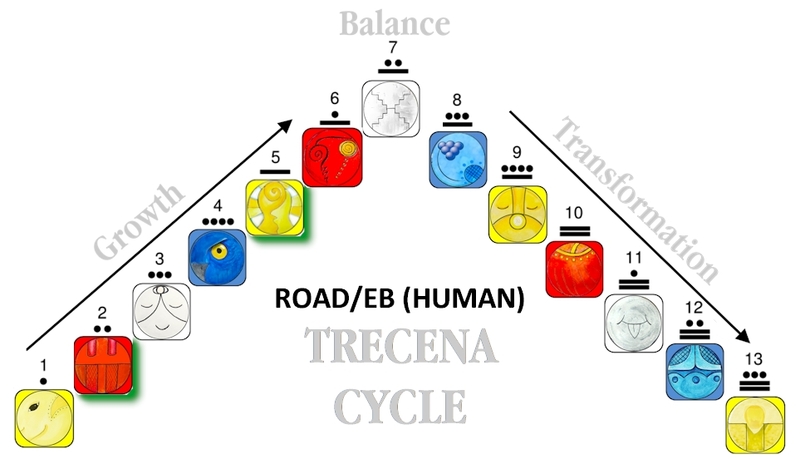 The Road/EB (Human) trecena is presenting us with an experience of walking in integrity with our Divine Destiny. Human’s destiny is the Journey of Life and the Evolution of Consciousness, completed by our experience of living. Human is the “bearer of time.” We are learning to walk in Truth of our Identity as Children of the Creator. Our work is an effort of Faith in the Intention of the Creator, who Seeded us with a Spark of Divinity. Aligned with Divine Will, we are One with the Power of Divine Authority. Sun/AHAU is the Day Sign of a Supreme Creator. AHAU also represents the Old Ones who rose to the Consciousness of their Divinity as Co-Creators. AHAU is a day to Honor the Ascended Masters. The Wisdom of their effort is a Divine Inheritance that makes our own Transformation possible. Human’s Highest Elevation of Consciousness is not accomplished alone, but is a process of change that is carried out by the Whole of Humanity. We were created to live a life of Meaning and Purpose. Each generation fulfills a legacy of Divine Consciousness that we are accomplishing together. Completing the 5th Uinal: Sun/AHAU is the last Daykeeper in the rotation of the 20 Day Signs. AHAU’s position is reflected as zero, a symbol of the Omega, the Last, the Whole, and the All in One. So is 9 a symbol of the Whole. 9 is the product of 3+3+3, 3 x 3, and 3 to the Power of 3 (ie. 3 x 3 x 3 = 27, 2 + 7 resolving to 9). [Today’s Gregorian date also resolves to the Number 9: 10+16+2017= 2043; 2+4+3=9.] The Ancient Hermetic Secrets of mysticism were attributed to Hermes and Thoth, both named as Trismegistus, meaning the Tris Hḗrōs in Greek, the “thrice or triple Hero,” the “thrice Great” – the Great, Great, Great or Holy, Holy, Holy of the Trinity. 9 Sun/AHAU completes the 5th Uinal of Divine Empowerment. Numbers reflect the Purpose and Meaning that is drawn from the Divine Feminine. Number 5 of the 5th uinal represents the Goddess of Love and Childbirth (Tlacolteotl). In the Harvest cycle of our becoming, this is the time of Sprouting when we are made capable to see what we will become. It completes a Journey that would help us Know the Dream that was planned for us at our own Creation… the Dream that was written in our Spiritual DNA. The repetitions in synchronicity with Tone 9, magnify the energy of a Completion of Transformation under the Higher Uinal Intention of an Empowerment. Sun/AHAU holds the Intention for us to See Ourselves in the Light of an Illumination. We are given the Light to see how our lives are connected to everything that has come before. We are amazed at the architectural feats of Human that require more than one generation to create. We wonder what would inspire Human to apply their life’s work to a project they would never see completed in their own lifetime. The Higher Purpose embedded in our Spiritual DNA empowers Human to lay the groundwork for future generations. AHAU reflects the Divine Masculine that generates the Power of our Will to complete our leg of a Journey to a Dream that was Dreamed before we were born. In the Harvest cycle of Transformation completed over the 260-days of the Tzolk’in round, the 5th Uinal is the Time of Sprouting. Under the Road/EB trecena, the Seed that found it’s way to the Light has taken on the leaves that would identify what it is meant to be. We can finally see something of ourselves that reveals our true identity. Knowing our Meaning and Purpose manifests the Power we need to persevere in an effort to Bless the Whole of Humanity. The days guided by Sun/AHAU always offer a Revelatory Experience. Sun shines the brightest Light on what is hidden by darkness, as well as what we overlooked – hidden in plain sight. We could compare it to the building of a pyramid. A single generation would fail to see their purpose if they only saw the stones they put in place. We were born Creators, always reaching for a Higher Accomplishment. An effort that must be completed together means that our lives would always offer something more to reach for, something greater than our Self. The Cherokee Day Sign, the Flower, symbolizes the face of the Flower that follows the Sun. From the Sun, the Flower draws the Light of Life, Happiness, and the Nourishment to Grow. Sun/AHAU is the Fire of the Will To Be… the Chalice of Infinite Power that is the very Cauldron of Creation. We are building the Spiritual Temple of Human that rises to the Sun. The Sun/AHAU represents the pinnacle of our Success. AHAU is the Master of All Accomplishment – lord, singer, dancer, artisan, athlete, and marksman. AHAU is the Hero and Visionary who, through Wise Judgement, is capable to lead and defend the people. Sun holds the expectation of our Highest Accomplishment, that through every challenge we take on new strength to Rise and Shine again. The Sun is the abode of the Great Spirit, the way station that relays messages and energy from the stars in the galaxy. Speaking the Living Language of Light, Sun shares the Wisdom of the Ancestors to ignite the Consciousness of a new generation of Being. Sun is a sign of great courage in the effort to create Abundance. Our Human Nature is to define ourselves by our accomplishments. Our Lower Experiences of living are the times when we lack a sense of direction, or suffer from an illusion that our lives no longer have any meaning or purpose. Sun/AHAU reveals the Light of a Divine Plan as seen by the Supreme Creator. Sun/AHAU reveals the Higher Meaning and Purpose of our Life and the effort that will be Multiplied to Abundance. Sun/AHAU can help us rise above our own struggle to see that every effort we make in following the Light of the Creator is One in the major accomplishment of Humanity. Every stone we put in place, is one less stone to be carried by all who follow. AHAU is the Leader who inspires our Will Power to hold Faith in a Higher Dream. This is a time to Honor the accomplishments of our Grandfathers and Grandmothers. Not so many generations ago, they forged new territory to create a better life for their children. They applied the Courage to willingly face the Unknown, holding Faith in something Greater that was beyond their own understanding. Their effort was intended to ease the suffering of a new generation, and to elevate the possibility of future accomplishments. Like the first Human to create the wheel, we are unable to see the ground-breaking nature of our own accomplishment. Only an Omnipotent Creator could see the future advancement that was made possible. Sun/AHAU shines the Light for us to See. To all my relations, may we look to the Ascended Masters from the generations before in the Light of our Human accomplishments. May we look deeper within our self to see that the leaves we’ve sprouted identify us as One. As we consider the difficulty of our own Journey, may we reflect on the greater difficulty of those who came before. May we see the Divine Value of our own effort, and the Truth that we are becoming the Old Ones for a new generation. We are building something that will last the Test of Time to be Honored by those who follow. May we make a commitment of our own Free Will to follow the Sun as the Source from which we will gather our Power. May we draw the Courage and Faith that is needed to carry out our Journey, remembering that the Creator already sees the Dream in its Full Light. May we know that when the capstone is placed at the top of a pyramid, the Honor will be shared by those who followed a Vision that could only be imagined in Spirit. May we Honor those people in our lives that challenge us to our Highest Accomplishment and lay the founding stones for our Upward Climb. More than half a million Rohingya refugees are fleeing Myanmar’s military offensive defined as an “ethnic cleansing.” They are fleeing to the Bangladesh side of the Naf River from horrifying accounts of villages burned, women raped, and scores killed in a “clearance operation.” Children arriving alone make up 60% of the exodus. The perilous journey is made on foot to the boarder, or by paying smugglers to take them across by water in wooden boats. Hundreds have died trying to escape. The persecution of Rohingya Muslims is born of religious discrimination that deems them unworthy to live. Bangladesh has been praised for its humanitarian effort to save lives. May we Honor all those who persevere in a Journey to the Unknown to find a place where they can belong, and Pray for the 300,000 children who are making the journey alone. May we call upon Divine Agency to Intervene so the Dream of their Journey is Realized to be Honored by future generations. so. before reading AGAIN- I prayed in thanksgiving for those before me. I felt them somehow. Also. just got news of two truths to work through-wow-I thought surely this was Flint-Ha! came to your blog as quick as I could. S two things seem to be going wrong-yet both things are capable of being in the end what I wanted-I either need to change direction-or I could be closer than before-again wow! So I need patience for things to “play out” as they will. Sometimes Sun feels like Flint to me too. They have a lot in common, only Flint’s hard truth is usually something I’m ashamed of. 🙂 We’re entering 6th uinal of flow and momentum. Astrology forecasts the 19th as big shift into movement. I-ching is forecasting pinnacle success mode this week. 🙂 We’ve been faith building from hurricanes, earthquakes, mass murders. Now we’re getting our power back.